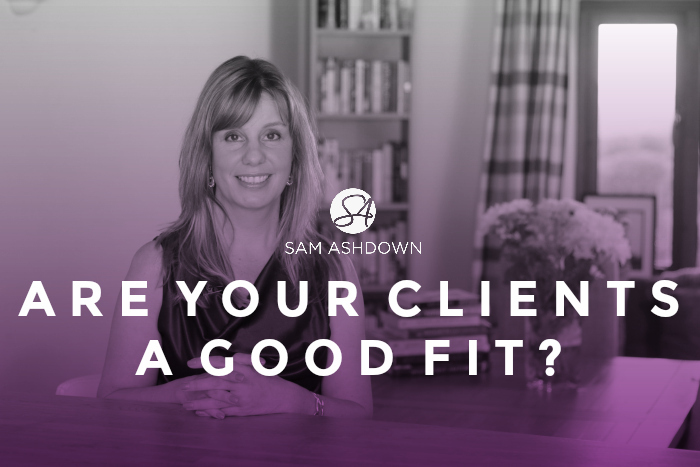 Are your clients a good fit? Good fit clients can give you a healthier bottom line and happier workforce. Find out how…. home to raise the kids, and is very active in the local community. We know when we’ve arrived at a Pat and Vince home; Pat is smartly dressed and we are shown into the drawing room, and served tea on a tray. Clues that these are Pat and Vince abound, from the Country Life magazines to the tasteful china; the graduation photos of the kids, and the ride-on mower in the garden. Perhaps you recognise them too? What’s the point of identifying Pat and Vince? And why don’t we want to work with those who aren’t? Let’s imagine a different scenario: we arrive at the door, and there is a new MG in the driveway. The lady of the house – Karen – is wearing jeans and slippers, and ushers us into the kitchen where we drink from cracked mugs. Karen has only lived there for a couple of years, and a pending divorce from her soon-to-be-ex, Kevin,is her motivation to move. The difference between these two clients is that one is a good fit, and one may not be. We know this from working with hundreds and hundreds of clients – some of whom have definitely not been a good fit. A good fit means that you like them, and they like you. The relationship starts strongly, with equal need from both, and a genuine motivation to work together. The feeling that we’re both on the same side, working towards a common goal, creates value within the clients’ mind, and they feel fortunate to be working with you. A good fit means that we speak the same language, so our expectations are aligned. It’s a satisfying working relationship that brings reward to both parties. When the time comes to pay our invoice, Pat and Vince pay willingly, and promptly, because they feel they have received excellent value for money, and that their investment has had the best possible return, ie the sale of their home for the right price and best timing for them and their future plans. When the fit is not a good one, the clues are there from the start. You may find that communication is not smooth, and conversations by email or phone leave you feeling that your client is not entirely happy with you. They start to niggle at you for little things, and use negative words like ‘disappointed’ and ‘frustrated’ in their emails. You’re coming up short, and you can’t put your finger on exactly how. When you get an offer on their home, the negotiations don’t go well. They seem inflexible, intolerant, and you worry you may lose their buyer. When you finally get to present your invoice, you receive in response an email tirade citing 20 different reasons why they shouldn’t pay the full fee. You see, Karen and Kevin were not a good fit for you. Not all clients are created equal, and not all of them are right for you. The clues are there, but only if you have first identified your ideal client – your version of our Pat and Vince. Start by thinking about your last few vendors. Who stood out, in a good way? Whose calls did you look forward to? Who thanked you often and seemed genuinely appreciative of your efforts? Which clients would you be pleased to meet in the street? Those are your ideal clients. The ones who are the best fit for you. Perhaps they are like you in lots of ways; ideal clients often are. Write down everything you know about them; their occupation, family, car they drive, pets, holidays, favourite shops – anything and everything you can think of. If you do this with several of your past ideal clients, you’ll start to see patterns, and similarities. This is your sweet spot. When you work with your absolute ideal client, the best possible fit, so much of your job becomes easier or even unnecessary. The good news is that you will naturally attract your ideal clients. The challenge is to make sure that your marketing is congruent with these clients, and targets them successfully. It’s not spray-painting you want, it’s a laser-sharp focus. Try this: as a team, brainstorm your ideal clients, and start to build up a list of all the keywords that are important to them. Record your phone calls with them, as well as your valuation appointments, and listen for those keywords: they are truly gold dust in your marketing, because they will act like a magnet for your very own Pat and Vinces, and importantly – they will also repel your Kevin and Karens. Find your good fits, and you, your team and your business will feel the benefits every day. Not only that, good fits are ultimately more profitable, so your bottom line will be healthier as a result. Speak to Sam: If you’d like to have a chat about how you can do it differently, drop me a line at sam@home-truths.co.uk– I’d love to hear from you. Next post What Do You Do With Your 168 Hours?